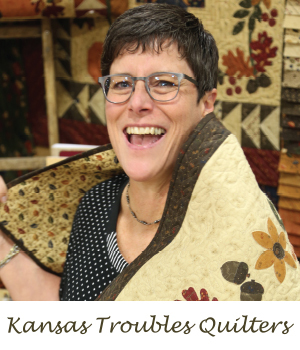 Lynne Hagmeier, designer and owner of Kansas Troubles Quilters, has been creating and sharing her quilt designs since 1995. She learned to quilt in 1987 while working at a local quilt shop-partly as a way to maintain her sanity as she and her husband, Robert, raised their six children. The last two children graduated high school May of 2000 and that has allowed her love of quilting to blossom into a full time business. Lynne has a very distinctive style of traditional quilting with adding her own personal flair by embellishing her quilts with wool applique’s and wool embroidery. Lynne's husband gets involved in the business. He is a history teacher and researches information for her quilts and the stories that inspire them. Lynne and Robert make quite a team. Good things just keep on coming with this gal. New fabric groups, new quilt kits, new quilter's journals... more.